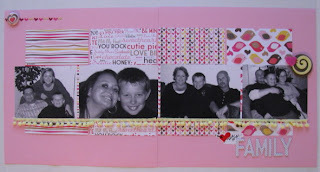 Yes, there is such a thing as National Scrapbook Day. It falls on the first Saturday of May each year - the same day as the Kentucky Derby. I started scrapping on Friday night and stayed up way to late scrapping while keeping an eye on the weather. Then I was up early yesterday morning (awaken by storms) and decided I might as well scrap. Although we headed out of town mid-morning for a birthday party, I was still a productive scrapper. Remember - I have 15 projects to knock out! 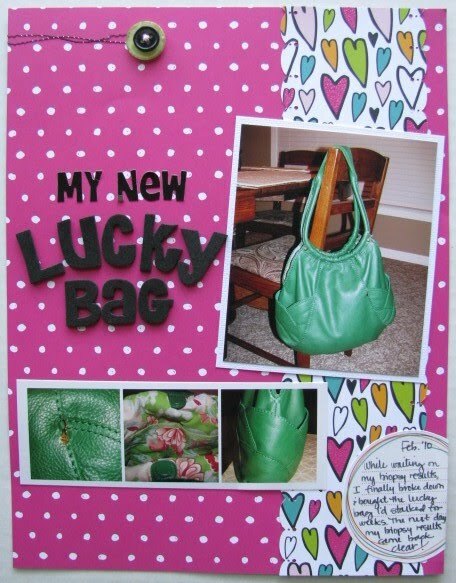 For the "National Scrapbook Day challenge" to scrap something scrapbook-related, I scrapped my scrap space. (Did anyone else notice I have "scrap" mentioned FIVE times in that last sentence?) 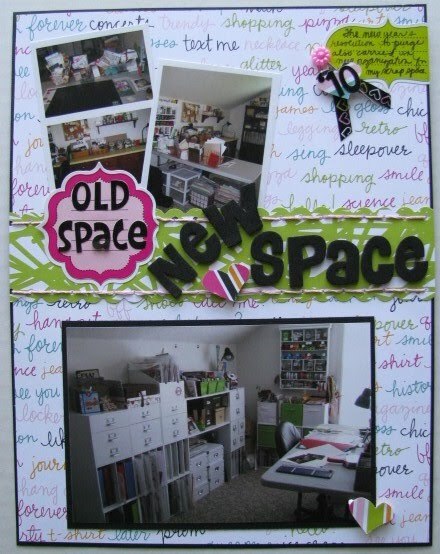 "Old Space New Space" documents how my space used to look (using Mamma's old row of sewing cabinets) and how it looks now that I invested in scrap storage storage cubes at the beginning of the year. 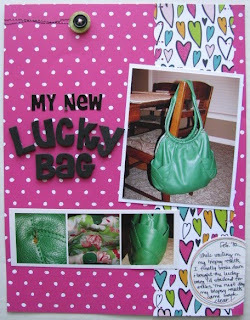 I used the American Crafts "Teen" line/Diva paper kit I purchased at Shannon Zickel's fundraiser crop in March. I find that once I have a coordinated line or "kit" out, I like to continue using it. I work faster that way and feel that it keeps my mojo going. So...I continued on with the "Teen"/Diva for my next challenge. It was a "Collage" challenge to use three photos (minimum) side by side like a collage. The amazing Lisa Hidy/jakobsmommy created a sketch that was used for one of the challenges. 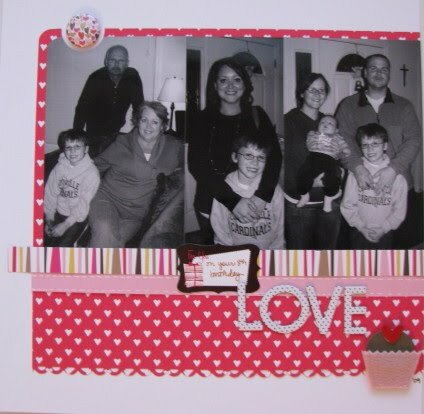 I altered the sketch a bit since I only had two photos to scrap and moved the title and journaling placements. I LOVE how this one turned out. 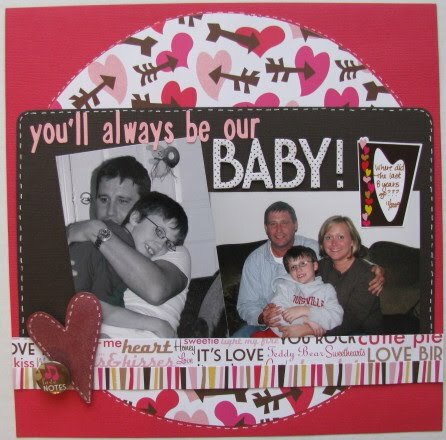 I used the American Crafts Valentine's kit with "I heart you" papers (from Shannon Zickel's amazing crop!). This is a line that I was worried I wouldn't use, so I just kept the kit out and looked for photos to match up to it. I liked these b/w photos of Kevin with his cousin Reese from last fall. "Love Reese to Pieces" (get it???) 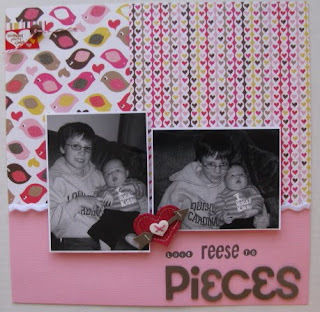 is a scraplift of a layout by PS design team member Heidi for the "Scraplift the DT" challenge. There was also a recipe challenge to use 1-12x12 sheet of white cardstock (check! ), 2 patterned papers (heart and stripe), 1 solid (pink), one alpha (check! ), and three embellishments (flair, sticker, felt cupcake). These b/w shots are also from Kevin's birthday in November. I didn't get too original with the song challenge. Knowing these b/w shots of Blake with family at his birthday in October would match this kit, I simply went with "We are Family." Yeah...not too creative... I do like my page though! These are all wonderful, but I especially love "You will always be our baby". I need to lift that title. I am always teasing my older two about he is the baby and he will get more than they got! Gorgeous layouts Amy...I love that you aren't scared of using pink for boys. Love all of these. You do such a wonderful job! Scraplifting + Noel Mignon = FUN!